CLIFFORD ESSEX CLAWHAMMER BANJO BRIDGE FOR NYLON STRINGS. Since the bridge on a banjo is not permanently attached, it is possible for a bridge to move out of position. The distance between the nut and the 12th fret is roughly the same as the distance between the 12th fret and the bridge. This is a good place to start. Use a ruler to put the bridge in the approximate correct position. Next, touch the 1st string lightly, right above the 12th fret with your left index finger. Pluck the string with your right hand, at exactly the same moment, remove the finger which is resting on the string at the 12th fret. You should hear a high pitched note, called a ‘harmonic‘. The harmonic at the 12th fret should have exactly the same pitch as the note you get when you fret that string at the 12th fret. Move the bridge very slightly until the note is the same pitch. Repeat this process each string. This is the best method of placing the bridge in the correct position. 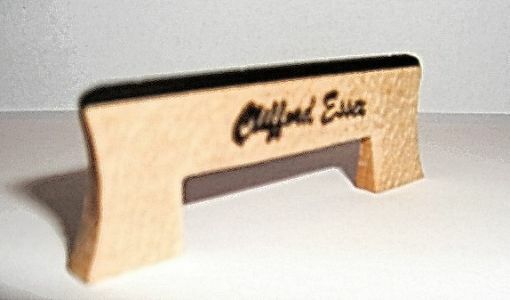 CLIFFORD ESSEX SPECIAL BANJO BRIDGE FOR STEEL STRINGS. Works well on various banjos. BANJO BRIDGE. GROVER NON-TIP. FOUR STRING. BANJO BRIDGE. 5 STRING. GROVER NON-TIP. FIVE STRING. CAMMEYER ZITHER-BANJO BRIDGE. HAND MADE BRIDGES. BANJO BRIDGE DELUXE. TWO FOOTED. THE PARKE HUNTER BANJO BRIDGE.